The biggest criminal in Australia is one Jack Wilton (Lazenby). He has his hands in everything: drug running, gun running, prostitution, and he even cheats when he practices Kung-Fu. Inspector Fang Sing Leng (Yu), of the Hong Kong Special Branch, has traveled to Australia to take him down. Working with the local police, Fang infuriates them because he has no rules and is a one-man wrecking crew. All of Wilton’s forces are after Fang - but can any force on earth stop THE MAN FROM HONG KONG? Wow. They truly don’t make ‘em like this anymore. What a shame. 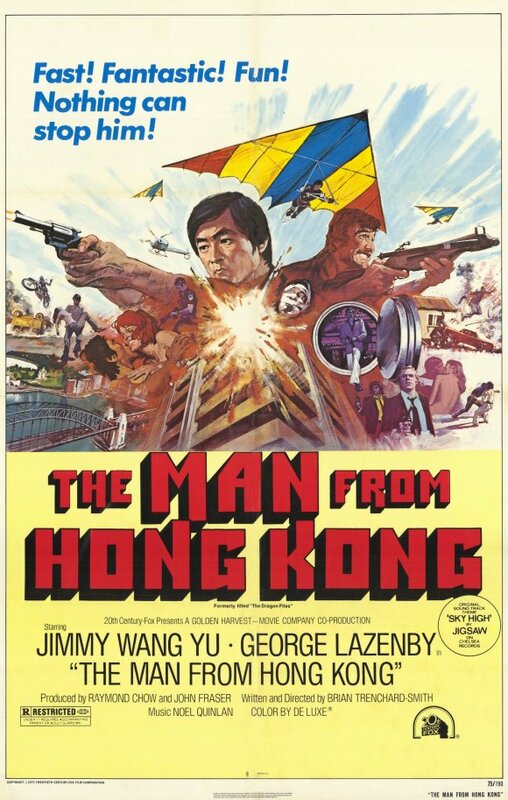 Starting from the great opening sequence with no dialogue, on through the exciting climax, The Man From Hong Kong delivers the goods and then some. The plot is perfectly simple, enough so that the movie can be packed with interesting locations, cool music, exciting stunts, tons of Martial Arts and car-chase setpieces, and still have likable characters as well. Not only is it well-shot, it’s all directed and edited with verve and energy. We salute the great Brian Trenchard-Smith, who, despite anything else he will ever do, will be a legend for this movie and Stunt Rock (1980). The movie is rife with 70’s style - just check out Lazenby’s “’stache-fu”, and his baddie pad (not to be confused with a bachelor pad). Also we get an excellent knock-down, drag-out fight between Yu and the great Grant Page which is as enjoyable as everything else in this superb movie. And there’s still time for some romance, as represented by the beautiful Rebecca Gilling as Angelica. On top of that, there’s some humor, mostly represented by Hugh Byrne and his great hair as cop Morrie Grosse. Because it was the 70’s, the stunts are real, and there’s no political correctness. It’s all just a perfect cocktail of pure, enjoyable entertainment. It’s just comforting to know there are writer/directors out there that GET IT. That understand great audience-pleasing tactics. Everyone here is at their best, and of course it doesn’t skimp on the action. 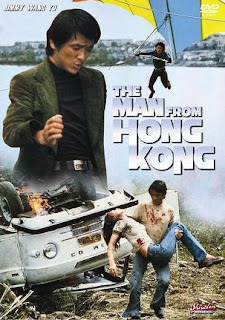 Sammo Hung is even on board, no doubt due to the fact that this movie was co-produced by Raymond Chow and Golden Harvest. It’s filled with “yes!” moments, which we believe we’ve mentioned before, where as a viewer, when something so cool happens, you just have to yell out, “yes!”. Everything is done right in this awesome film, and the 2-disc Australian DVD pays this great movie a nice tribute. If you can find it, it seems to be the ultimate way to own this classic. Shockingly, this movie was not released on VHS in the U.S. until Tai Seng did a quiet, under-the-radar release in 2001. Because it didn’t receive a golden-age VHS release on, say, Vestron, Paragon, Lightning, or a label like that, the movie’s cult stature grew, but mainly in other territories around the world. With the advent of DVD, this can be rectified, and all can now see this fine film. Featuring the ultra-catchy, legendary song “Sky High” by the great band Jigsaw, The Man From Hong Kong is a must-see. An Aussie chop-sockey classic! Trenchard-Smith can do no wrong. Can't agree more! What an awesome movie. Oh yes. The Man From Hong Kong is truly a B-Movie classic. It's so well paced and packed to the gills with varied action set-pieces. We watched it at a movie night a year or so ago and it went down incredibly well. It's a film that deserves more attention than it gets. It is perfect for a movie night. It has everything you want in an action flick! Fortune Star released a remastered version of this a while back in Hong Kong which has since gone out of print and is very hard to find and when you do find it, the price is astronomical. I thoroughly enjoyed the film in spite of it's flaws. I've been wanting to see this for some time. You've convinced me to check it out sooner than later. Trenchard-Smith has done some classics. Great review! Steve: Thanks for the info. We appreciate it. Cool video by the way. The Video Vacuum: Thanks! See if you can track down the Australian DVD. This would rank towards the top of his best work. Dead End Drive In was my personal favorite film of his(though both of his Panther films and Escape 2000 come close)Too bad he's been reduced to directing lousy films like Artic Blast for the past decade or so(his last good film was "In Her Line Of Fire"),though he is currently filming a new action film called Deception with Emmanuelle Vaughier and Cuba Gooding Jr. That sounds interesting. Totally agree Dead-End Drive In was a solid horror-action flick. Will have to check out In Her Line Of Fire. Heard about Deception. Seems like a perfect rental. I bought the Joy Sales release of Stoner and it was good considering, but I passed on MFHK. Apparently it had some production problems as well, such as Jimmy Wang Yu thinking he was supposed to direct. So I was not prepared for such a quality product. I might have to splurge for the Australian special edition. Speaking of Aussie movies, I just wish there was a special edition of (She Was) Fair Game. Another incredible HK foreign partnership production is Cleopatra Jones and the Casino Of Gold (far superior to the first film;, available as a MOD. The OOP PAL version has subtitles). It's worth the splurge. Killer dvd release. Will have to check out Cleopatra Jones, Fair Game and Casino Of Gold. Thanks for the recommendations guys!